The British Museum is free, well sort of. This post is a guide to visiting the museum and explains which exhibits are free and for which you have to pay for a ticket. WHAT CAN YOU SEE FOR FREE? The museum is free if you want to visit the Great Court and several of the main galleries. However, the British Museum also features a handful of paid exhibitions and you will need tickets for those. Prices for the paid exhibitions range immensely, so see the British Museum website for an up-to-date list. For a full list of the current paid exhibitions, read our ‘Paid and Free Exhibitions’ section below. Members of the British Museum can visit the paid exhibitions for free. To become an annual member, register here. The galleries are open daily from 10.00–17.30. However, on Fridays, the galleries have extended hours and are open until 20:30. The Great Court, on the other hand, is open daily from 09.00–18.00 (6 pm), and 09.00–20:30 (6:30 pm) on Fridays. There are a number of completely free exhibitions. Below are the regular tours offered by the museum. We also offer our own tour on Fridays. These tours run every 15 minutes between 11:00-15:45 (3:45 pm) from different areas of the museum. The tours are completely free to follow, are held within one of the free galleries, and typically last 30-40 minutes each. Because there are so many offered throughout the day these brief, taster tours are perfect to take if you’re short on time and keen on learning more about the artifacts in a specific room. The Lunchtime Gallery Talks are held on Tuesdays-Fridays at 13:15 (1:15 pm) in one of the many galleries. They last 45 minutes and range immensely. For a full list of all the Lunchtime Gallery Talks offered, see their upcoming calendar. The talks are led by one of the museum curators or a guest speaker. These tours take place every Friday evening as an accompaniment to the late night open hours. They last 20 minutes each, and run on the hour and half hour between 17:00 and 19:30. The topics change every Friday, but each focuses on a particular time period or theme. Click here for the weekly schedule of Spotlight Tours. This signature tour covers several highlights from each of the free galleries. Learn about the Rosetta Stone, the Parthenon frieze, and the Lewis Chessmen, amongst many other things. The tour aims to educate guests on important artefacts from various cultures around the world. At 90 minutes long, this is by far the longest tour offered by the museum. It is also the only paid tour, costing £12 per person. Book your place in advance online. Finally, the British Museum also offers an audio guide which can be picked up from the audio guide desk in the Great Court. The guide costs £6 and is available to use until 30 minutes before closing. Unlike the staff-led tours, the audio guide allows guests the freedom to pick which galleries or specific objects they wish to learn about. In total, there are 260 expert commentaries that are available in several different languages. The audio guide also features an interactive map of the museum, making it easy to navigate the many different galleries. For a free audio tour alternative, check out the excellent Rick Steves audio guide. Sunken Cities: Egypt’s Lost Worlds — This exhibition features artifacts from Thonis-Heracleion and Canopus–two lost cities that were once located on the edge of the Nile. For the last 20 years, a team of archaeologists has been excavating objects from the Mediterranean. Each offers insight into the ancient civilisations of Greece and Egypt. South Africa: The Art of a Nation — Explore more than 100,000 years of South African history through art through this exhibition. It features some of the world’s oldest art, as well as more recent pieces that reflect the country’s contemporary culture. The American Dream: Pop to the Present — This exhibition features American pop art and prints from the 1960s and onwards. Artists such as Andy Warhol, Jasper Johns, and Kara Walker are amongst several others whose work is on display. Major political events, such as JFK’s assassination and the Cold War, in addition to several social issues like the AIDS epidemic and racism, serve as inspiration in each piece. Tottenham Court Road Station (Central Line and Northern Line). Additionally, there are several bus stations nearby. This post reviews and compares the various evening and night tours of London, including our pay-what-you-wish options. You should also take a look at our 42+ things to do at night post. This is a comparison post of the best London ghost tours, the dark side of London tours, and haunted bus tours, including our pay-what-you-like London ghost tour. The following are traditional ghost tours that bring London’s haunted history to life. Each runs for 2-2.5 hours and costs approximately £12-£20 per person. Free Tours by Foot is the only company to offer a pay-what-you-like ghost tour, which takes you near London Bridge to learn about the city’s darker history. This post covers the top 10 things to do in the City of Westminster. We also offer several other posts that could be of help. The City of Westminster is the most target rich area for major tourist attractions and a great place to go sightseeing. Posted April 2nd, 2019 by courtney shapiro & filed under London. This post covers how to visit the London Dungeon, including best times to go, ticket prices, what you will see, and how to save money on tickets. Posted March 31st, 2019 by Stephen Pickhardt & filed under London. This post is our guide for things to do in London, with tips on free things to do, suggested nighttime activities, things to do with kids, top attractions and other points of interest, updated for 2019. Posted March 19th, 2019 by Stephen Pickhardt & filed under London. This post discusses how to visit St. Paul’s Cathedral, including tickets, discounts (including free entry), and other tips on planning your visit here. Posted March 18th, 2019 by Margaret Stockton-Davies & filed under London. This post covers how to visit London’s Imperial War Museum, including details about the main exhibits and what you can expect to see when you come here. The Imperial War Museum is an organization comprised of five locations around England. Three of them can be found in London, including the museum we will cover in this post as well as the HMS Belfast and the Churchill War Rooms. However, when in London, references to the ‘Imperial War Museum’ specifically mean the war museum in the southern part of town. One of the most powerful and impressive museums in London, the Imperial War Museum is a world-class visitor attraction and, best of all, is totally free! For more information on London during the Blitz, make sure to check out our fascinating World War II Walking Tour. The following section will include all the details you need to plan a trip to the Imperial War Museum. There is no ticket needed and there is no cost to enter the museum. 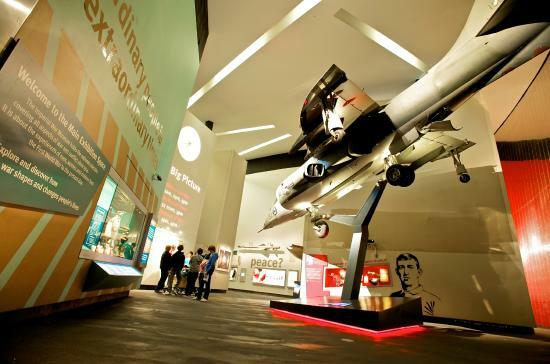 The Imperial War Museum is just one of many free London museums as well as one of several military museums in the city. The Imperial War Museum is located at Lambeth Road, London SE1 6HZ. Use this Google Maps link for specific directions from anywhere. This site is right across the street from St. George’s Cathedral and just a few blocks from the Westminster Bridge and other notable landmarks. The easiest way to get here is to take the London underground to one of three nearby stations: Lambeth North, Waterloo, and Elephant & Castle. The Imperial War Museum is open 7 days a week. Visitors are welcome from 10 am – 6 pm every day. Like most popular attractions in London, the Imperial War Museums are busiest during the middle of the day from 11 am – 4 pm. If you’re trying to avoid the crowds, you may want to consider a visit either earlier from 10 am – 12 pm or later in the day from 4 pm – 6 pm. The Imperial War Museum is busiest on Saturdays in particular, so we recommend coming on a weekday if you can. It is recommended to set aside around 3 hours to see everything, but many people seem to be satisfied with just 2 hours. This section will cover some of the more notable exhibits you may want to check out. All of these exhibitions are permanent and free to enjoy. If you want to learn more about WWI, this set of galleries covers a lot of the most notable moments during the battle. There are over 1,300 artifacts on display include weapons, uniforms, films, artwork, and keepsakes. With a variety of artifacts from throughout the era of 1934-1945, this exhibition gives visitors a look at some of the most notable items, objects and people who played a role in changing the world during the events of WWII. This exhibition features photos, artifacts, documents, films and other important objects from this important historic event. This gallery focuses on some of the more unusual items that have a connection to war. There are objects spanning almost 100 years of British military history. This exhibit features nine important objects that played an important role in historic battles. In addition to a V-2 rocket, there is also a Harrier jet, a Spitfire plane, a T-34 tank and more. Learn about some of the bravest and heroic people who have ever fought for Great Britain in this special exhibit covering the stories of more than 250 courageous people. This gallery also includes a lot of interesting artifacts from their past. Covering the 70 years after WWII (1945-2015), this exhibition reveals how battles and conflicts since then have changed the course of history in countries such as Iraq, Afghanistan, and Kosovo. Posted March 18th, 2019 by Stephen Pickhardt & filed under London. This post covers things to do in London in April, including a top 10 list as well as sections dedicated to free things to do, nighttime activities and family-friendly options, updated for 2019.